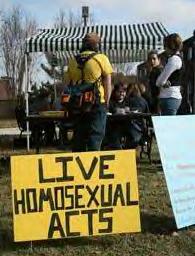 Students at Kentucky’s Murray State University engaged in “live homosexual acts” in public on Friday to raise “awareness about the lifestyle of gay members of the Murray State campus,” according to a campus newspaper. Antigay and ex-gay activists were strangely uninterested in taking pictures of real gay people engaging in real homosexual activities. Here was a prime opportunity for Fred Phelps and Peter LaBarbera to hold up No Studying, No Talking, and No Sexual Honesty signs – and they missed it entirely.